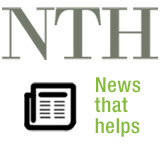 NTH :: Will extended stock exchange trading hours help retail investors? The Metropolitan Stock Exchange of India (MSEI) is keen to extend trading hours to 5 pm. This might force top exchanges NSE and BSE to follow suit. However, will the move benefit small investors? ET Wealth reached out to market participants to know their views. Extension of trading hours will help drive volumes, which helps market liquidity, increasing confidence of smaller participants. For secular retail participation in the capital markets, two things are important. One, education about the asset class and two, the confidence in the markets. While institutions are investing in educating the clients, confidence of small investors in markets will be boosted by growth in volume and more broad-based participation. A. It will increase time overlap with global markets, thereby reducing, to some extent, open gap shocks. Minimising such shocks is good for retail and small investors as it helps reduce the volatility of returns. In a country like ours where retail investors have traditionally invested in FDs or physical assets like gold and real estate, low equity market volatility will be a confidence booster. B. Extension of trading hours will also help drive volumes which is good for the overall market liquidity, thereby increasing the confidence of smaller participants in the equity markets. As it is evident that more overlap with global markets and increased volume is good for all market participants, extending trading hours is an idea worth exploring. If India is to become a global financial powerhouse and if exchanges are to become truly international, we need to have extended trading hours. The Indian capital market is significantly influenced by the global markets and global investors. No market participant can deny this influence and co-relation. The most influential global market is the US market. It starts trading long after the Indian markets close. This creates a peculiar situation which leads to “gap-up” or “gap-down” of opening of Indian markets post any major global event. For the health of any market and its investors and in particular the retail investors, this is definitely detrimental. Extending Indian market hours to align with at least the opening of the US market, will prevent some uncertainties. Further, Indian financial markets, systems and processes are now robust enough to support long market hours. Both back office processes and banking activities even in normal course, continue far beyond the present market closing hours. Thus, adopting extended trading hours should not pose any operational or banking issues. If India has to become a global financial powerhouse and if Indian exchanges aspire to become truly international, we need to have extended trading hours. However this can be done over a period of time in phases. At this stage, extending trading hours up to New York opening time, should at least be considered. Impact of moves in global stock exchanges do impact the opening levels of Indian markets but in most cases, that effect is overcome in a couple of hours. For small investors, extended trading hours will not help in any way. The six hours available now for trading are sufficient for price discovery and execution. With mobile trading on the rise, even investors who are occupied at work till evening can track the markets and trade within the trading timings. Though currency and commodity markets are open till late, this is mainly to allow hedgers/traders to track forex markets or commodity prices abroad. As far as equity markets are concerned, Indian stocks prices do not track any other prices on a minute-by-minute basis. Impact of moves in global stock exchanges do impact the opening levels of Indian stock markets but in most cases, that effect is overcome in a couple of hours. Exchanges would like to extend time to offer differentiation, gain market share and boost income. Compulsive traders would like extended hours to get more opportunities to trade. Brokers would welcome extended hours provided the incremental revenues are more than the cost in terms of manpower and other running costs. However, they currently feel that extending trading hours would bring more pressure on them and may not result in much higher volumes and revenues. Markets are trending for 25-35% time and are range-bound/trendless for the balance period. In the latter period, extending the trading hours could prove to be discomforting for all participants. A small trader has a defined risk appetite and that doesn’t change because more time is available. He will be looking at price levels, not the time. Proponents of the benefit of longer trading hours have often justified this by giving examples of the commodity exchanges etc., which work for longer hours. While it may benefit certain segments of investors and traders, I don’t see any direct benefit to smaller investors, at least not immediately. The small trader has a defined risk appetite and that doesn’t change just because more time is available. The small investor will typically be looking at price levels, and not necessarily the time of day to take decisions. Self-driven clients trading online may possibly do more trades, but that is a conjecture at this stage. It might negatively affect relationships between small traders and sub-broker or RMs who typically meet in the evenings. This can affect fund flows with cheques not collected in time or that client feeling a deficiency in services if not met regularly. In fact, brokers might desist from offering sit in or walk in services at low brokerage rates due to the enhanced costs of an extended day and attempt to pass on these costs. What’s most likely is that the same trades are likely to now get staggered over a longer period. The benefits of an internationally aligned market are more likely to accrue to bigger investors. While European and Asian markets get factored into our markets adequately, the US markets open much later than 5 pm and therefore, it is unlikely that volatility would reduce due to the additional hours. 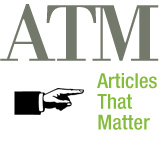 ATM :: Should you invest based on past performance? Equity funds have made a comeback with strong returns. Here is how to select the right fund. Haven’t your equity funds given handsome returns in the past one year after underperforming for a sizeable period? The change in fortunes of these funds can be attributed to the sharp run up in the stock market over the period. But did you invest in UTI Transportation and Logistics Fund, Sundaram SMILE (Small and Medium Indian Leading Equities) Fund, DSP Blackrock Micro Cap Fund or Birla Sun Life Pure Value Fund? If the answer is no, then you may have missed a trick. 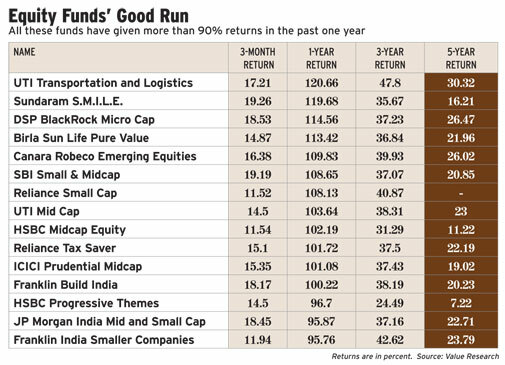 UTI Transportation and Logistics Fund topped the equity fund category in the last one year with returns of 121% compared to 38% returned by the BSE Sensex, followed by Sundaram SMILE (Small and Medium Indian Leading Equities) Fund (119%), DSP Blackrock Micro Cap Fund (115%), Birla Sun Life Pure Value Fund (114%) and the Canara Robeco Emerging Equities Fund (110%). What worked for these funds, some of which are not the top-of-the-mind schemes in the Source: Ace Equity mutual fund universe? For UTI Transportation and Logistics, it was the sharp run-up in auto stocks. As the name suggests, the fund invested large amounts in companies in the transportation and logistics sector. Though a large-cap fund, it takes specific sector calls (74% investment in the automobile sector) and, hence, also qualifies as a sectoral fund. The commonality between UTI Logistics and the other funds mentioned above is that they all invest in mid- and small-cap stocks, again a specific theme. The run up in these funds performances can be attributed to the rise in mid-cap stocks in general. The mid-cap index, for instance, has returned 65% in the last one year compared to a 38% return delivered by the BSE Sensex. Small- and midcap funds typically outperform in an upward trending market owing to the marginal incremental risk they take. The small- and mid-cap stocks come with high beta (an indicator of their relative volatility) and, hence, their returns can be multifold, which is difficult for large-caps to mimic. In terms of market cap, the midcap and small-cap indices returned an astounding 69% and 96% respectively during the bull run from January 2007 to January 2008 leaving behind the BSE Sensex’s 46% return. This was mimicked by funds investing in these stocks like the SMILE Fund, which returned 82% during the period. Thereafter, came the market bust (January 2008 to January 2009) and the smallcap and mid-cap indices lead the race to the bottom, losing 66% and 72%, respectively, compared to the Sensex’s fall of 51%. According to Anil Rego, CEO and founder of Right Horizons, small- and mid-cap funds are a ‘high-risk high-return’ strategy and, hence, during a bull run they tend to do well. However, when the markets are down, mid-caps tend to fall more than large-caps because of their high beta (usually more than one). Since they are less liquid than large-caps, they are inherently more volatile. Financial planners say midcaps should not be part of your core portfolio at any point of time. 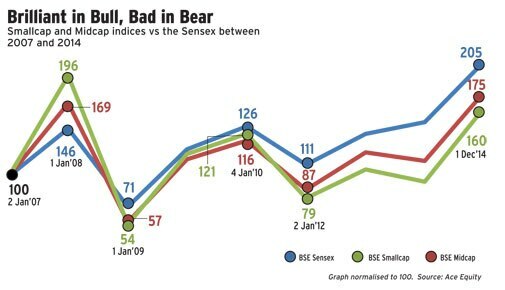 There is good reasoning behind this: from 2007 till date the BSE Sensex has returned a 9% a year, the Mid-cap Index has returned 7% while the Small-cap Index has returned only 6%. Sectoral funds have higher risk than mid-cap funds but they could also have periods of extreme outperformance. The infrastructure sector was touted as the star during the bull run of 2006 and 2007 and the Infrastructure Index retained the top slot for about two years owing to a roaring economy and the government’s thrust on the sector. Hence, funds based on the infrastructure theme delivered returns of 85% (in 2007) but were also among the biggest losers (their value eroded 56%) when the sector went out of favour in 2008. On the other hand, diversified equity funds didn’t make a killing in the bull run but ended up with a limited downside compared to the fall in the Sensex. Further, diversified funds help deliver higher riskadjusted returns in the long term by mitigating risk by spreading across different sectors. With the economy back on track, the focus is now likely to shift towards investment. Capital goods and infrastructure have already started doing well. But only focusing on infrastructure funds would entail quite a bit of risk in case investment activity does not pick up. Only if you have the research expertise and conviction on a certain sector should you consider investing 15-20% money into sectoral funds. According to Raghvendra Nath, MD, Ladderup Wealth Management, it would be improper to come to a conclusion on the basis of a year’s performance. Such performance can be due to a few chance allocations to certain stocks or sectors. Rego adds that Sundaram SMILE Fund’s performance is not consistent with its peers and returns in the short term can be like a flash in the pan. He instead suggests funds with consistent returns. Even though they may offer lower returns in the short-term, they don’t get stuck on the down side. Past performance is only one of the indicators for evaluating a fund. “Developed markets deploy many ways to evaluate fund performances. However selective data display and ‘cherry picking’ can harm investors,” says Tushar Pradhan, CIO, HSBC Global Asset Management, India. Comparing a fund’s performance against others over a stipulated period can be hazardous. “Risk parameters, expense ratios, fund manager’s track record, turnover ratios and many other fund metrics can help provide a much more balanced view. We encourage investors to look at the performance in conjunction with the risks undertaken,” says Pradhan. Risk statistics like beta, for instance, will tell you the stock’s relation to the general market. A beta of one indicates that the stock will move with the market while a beta of less than one means that the stock will be less volatile than the market. A beta of greater than one indicates that the stock will be more volatile than the market. While selecting a mutual fund, analysts also use other ratios such as Sharpe ratio, which helps gauge how much of the extraordinary returns generated by a fund are a result of extra risk taken by the fund manager. A higher ratio indicates that the investor is earning a good return despite low risk. A combined rank encapsulating these can be a better measure than comparing performance alone. It is also important to ascertain whether the fund is being run in accordance with its investment objective and the investment strategy is transparently communicated to investors. Research companies like Value Research and Morningstar assign ratings to funds based on certain parameters. However, they may not all be the same. “Ratings should not be the only criteria; investors should also look at the overall outlook and also compare performance of funds in a similar segment,” says Rego. The best approach is to take an equal exposure in large-cap and midcap funds. “Large caps give stability to the portfolio and mid-caps provide extra returns in the long term,” adds Nath. Once the market has gone up, invest via SIPs which will help generate higher returns by reducing the average purchase cost.